This set is great for all race distances. It can be used as a test set, final prep to check race readiness or simply as a good hard training set. Effort level and recoveries can vary, but it’s best used as a hard, race pace or threshold effort. Hitting goal times on short recoveries indicate race readiness. As a former ITU World Cup Champion, I used this set throughout my career. I knew I was ready to race when I could nail my goal times. One year, at the end of an exhausting training block, my coach sprang this set on us at the very end of a swim workout. I was bleary-eyed with fatigue, longing to get some recovery and furious with him for doing this to me! BUT, at about interval #4, I realized I was hitting faster times on a shorter send off than I had at any time in my entire swimming career. I left that session in awe, amazement and filled with confidence at my new found swim speed. As a coach, I use this workout with all levels of athletes as it helps us both feel confident in their swim progression and preparation. Hands down, this is one of the most neglected aspects of swim preparation I see. The law of specificity states: train in an environment as close to race conditions as possible. From first timers to the highly experienced racer, open water training is critical to success. I’ve seen, both as a coach and an athlete, national caliber pool swimmers struggle and panic in the open water. Pool swimming ability does not always directly or quickly transfer to the open water. Although swimming is swimming in any body of water, triathletes need to develop and master a different set of skills for a successful triathlon swim. Navigation, breathing and stroke style are different based on dark water (can’t see the bottom! ), rough conditions, currents, temperatures and swimming with 100’s of other bodies swarming around you. Whenever open water is available, I have my athletes out there as much as possible. When I worked as the USAT National Development Coach, Summer Cook was just starting her career as a triathlete. Her swim skills, fitness and speed in the pool were fantastic. Her first day in the open water was cold and she struggled. After several months of open water swim training, she was first out of the water at her first big race in Clermont, FL, won the race and earned her pro card. In my racing days, we just did intervals and intervals always meant riding very hard. Now, as a coach with a much greater volume of experience, I know that ‘intervals’ simply mean a varying set of intermittent efforts with varying work to recovery ratio. This opens the door to a world of possibilities. Race effort intervals were, at that time, threshold intervals. Sets of intervals consist of 5-20 minutes with short recoveries (1-5 minutes). These intervals are relevant for all race distances, especially short course athletes. Pushing your threshold higher, whether based on heart rate, power or perceived exertion, helps your body learn to buffer lactic acid, improve speed and power and trains your mind to handle the pain of a hard race effort. Threshold efforts give a lot of ‘bang for the buck’ as they are easier to recover from and not as taxing on the body as VO2 max intervals. 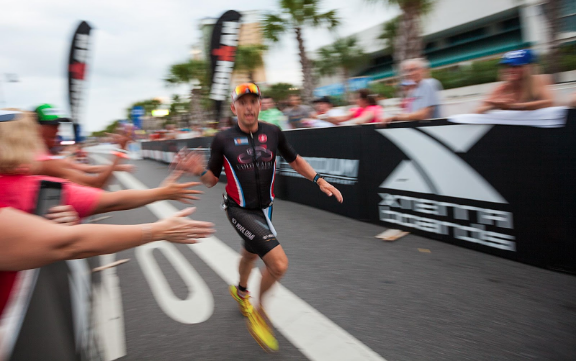 When I coached Matt Chrabot during his ITU career, threshold sets were a staple of his training plan and a robust measure of his fitness and race readiness. During his time, he was one of the athletes and was instrumental in keeping the pressure on the field to really race the bike leg. There are many levels of group rides, even for new cyclists. The ability and opportunity to ride with others helps grow your skills and fitness. You get faster when you train with those who are faster than you are, learn to improve your bike handling skills and supports preparation even for non-draft races. If you’re racing draft-legal, group rides are a must! When we first moved the resident program to Scottsdale, AZ from Colorado Springs, one of the first rides the athletes did was the long local group ride. This helped them learn the roads, meet the local cyclists and work on their group riding skills. We pushed the envelope and had them ride at night to a weekly criterium style group ride on a closed loop course. Katie Hursey, Chelsea Burns and Kevin McDowell’s skills, fitness and confidence soared after conquering these rides. It’s exhilarating to ride under the lights on a summer night.